Simple Future Tense is used to construct sentences about future time ( time after now ). In other words, Future Tense indicates the actions which will occur in the future. 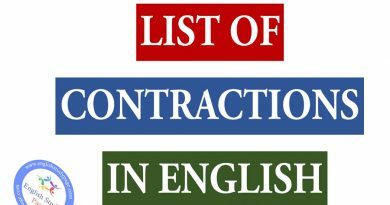 “will”, “shall” and “be going to” are auxiliary verbs of Simple Future Tense. will –> ‘ll Ex: I‘ll come back. will not –> won’t Ex: I won’t study. shall not –> shan’t Ex: We shan’t make any agreement. be(am/is/are) going to –> ‘m/’s/’re going to Ex: She‘s going to buy a car. be(am/is/are) not goint to –> ‘m/’s/’re not going to or isn’t/aren’t Ex: They‘re not going to get a card. / They aren’t going to get a card. Elizabeth will be a doctor soon. Is the party going to be interesting? My father will retire next year. Paul will not ( won’t ) play basketball. I am going to meet with Lisa tonight. I will ( I‘ll ) call him as soon as possible. We shall overcome the problems. We won’t live the house. George will try to contact us next week. They are not going to study math. Will Lisa be here soon? We use other question words ( Like Who, What, Why , etc.) in present tense. What will we do next week? Where will they go next year? How will we live on other planets? We will ( We‘ll ) see him. I will ( I‘ll ) stay at home. Will you visit your grandmother? I will ( I‘ll ) write you. Donald won’t play any games. A: I’m afraid we’re lost. B: I’ll stop and ask the way. A: This book is really interesting. B: Really? I’ll read it. A: The door bell is ringing. B: I’ll open the door. You look very tired. I’ll make up a bed for you. The load you carry is heavy, I will help you. I have a headache. I’ll take a medicine. 3. It is used for the facts that are related to the future and we can not prevent them. My son will be 3 next week. Ally will be 15 next year. The World will end in the near future. The sun will set at 6 o’clock. 4. 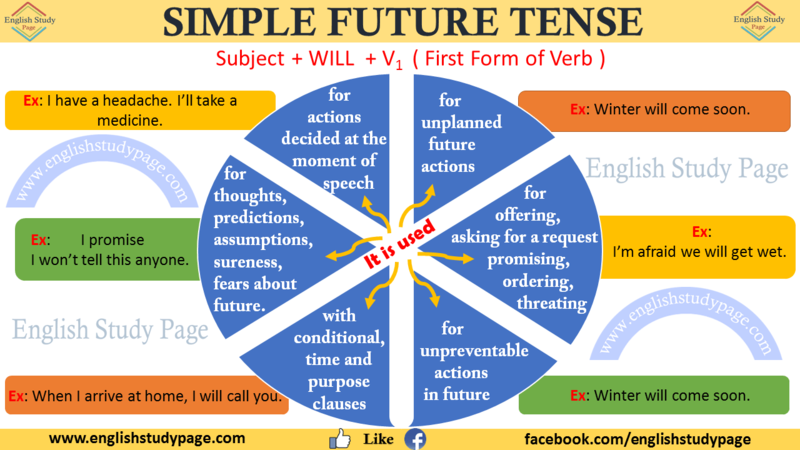 Future Tense is used for someone’s thoughts, hopes, predictions, assumptions, sureness, fears , about future events. A: The subject is very complicated. 6. 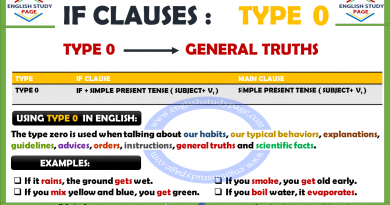 It is used with conditional, time and purpose clauses . after, before, until, once, while, as soon as, by the time, till ). 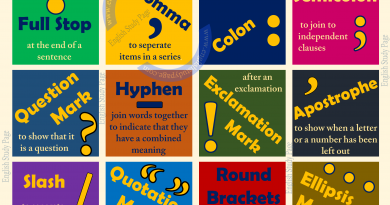 The use of shall as an auxiliary verb has been greatly reduced in recent times. We see it only in formal writings. However, we can use or see “shall” as stated below. “Shall” is mainly used to make an offer and a suggestion or to ask for advice with subjects “I“ and “We”in questions. I am going to see him tonight. Are they going to go to the party tomorrow? He is not going to stay at the hotel. 1. It is used to make prediction, especially when we can see something is about to happen. Clark and Lisa are engaged. They are going to marry next month. He is a student. He is studying English at a university. He is going to be a english teacher next year. Mary is pregnant. She’s going to have a baby soon. Look at the black clouds in the sky. It’s going to rain. Watch out! This vase is going to fall on you. “Will” is also used to make prediction. However if there is an evidence, “be going to” is prefered instead of “will”. 2. It is used to indicate planned actions. They have made reservations for their summer holiday. They’re going to spend their holiday in London. The boss waits reports about incomes every month. So he is going to write a report the day after tomorrow for this month. Jully is calling her friends for breakfast. She is going to make a delicious breakfast tomorrow. I‘m not going to go out until this project is finished. Mark is going to organize the celebration. “Will” is used for unplanned actions in future. I have got a flight ticket to 3 o’clock tomorrow. I‘m going to fly to England.